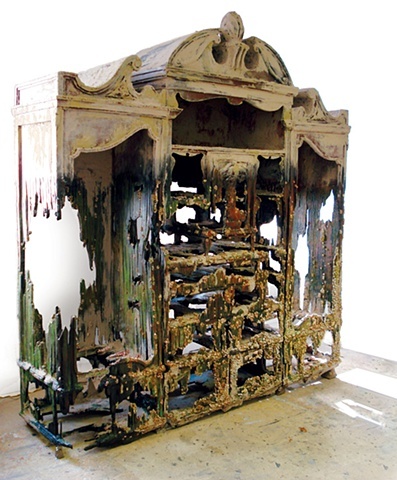 Shipwrecked Armoire with Barnacles, 2012 recalls the darker side of expansionism and mercantilism with its haunting skeleton. What was once a container for clothing in a wealthy home becomes a strainer for the ocean and its secrets. Situated next to Hegartys altered clipper ship paintings and water damaged hand painted imitation Chinoiserie wallpaper, the repressed histories of colonialism reverberate calling to mind Orientalism, opium dens, pirates and human cargo. This fabricated early American armoire appears as if it has been cast out to sea, floating in the ocean like driftwood and overgrown with barnacles, perhaps a casualty of a storm inspired from the many shipwreck scenes in Maritime art. Or there is the possibility of an alternative narrative where a cataclysmic flood entered the home, only receding when all its contents were turned into a coral reef, the armoire coming back to life as a living skeleton of barnacles.